One of Italy’s most prestigious and widely-read publications, L’Espresso, has announced its restaurant rankings for the L’Espresso Restaurant Guide 2016, and needless to say Massimo Bottura’s Osteria Francescana has been awarded a shining result. No surprises there, we hear you say…but this time, Osteria Francescana has reached new heights, making history in the process. For the first time on record L’Espresso has dished out a 20/20, and by now you may have guessed who that has been awarded to… full marks for Osteria Francescana! 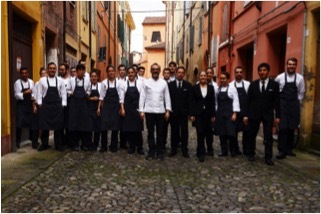 A huge congratulations to Massimo Bottura and the whole team in Modena for this wonderful achievement. Once again, they leave us wide-eyed and open-mouthed in astonishment and admiration… what will they achieve next?? Click here to read more about Massimo Bottura, and here for the Osteria Francescana website. This entry was posted in Foods Blog, Massimo Bottura, Osteria Francescana, Spoon blog 2015 and tagged Franceschetta 58, italy, massimo bottura, modena, Osteria Francescana, Restaurants. Bookmark the permalink. Brilliant news! I had one of my best meals ever at Osteria Francescana when I visited last year and I really hope to go again some time! !